Billie Breslin has traveled far from her California home to take a job at Delicious, the most iconic food magazine in New York and, thus, the world. When the publication is summarily shut down, the colorful staff, who have become an extended family for Billie, must pick up their lives and move on. Not Billie, though. She is offered a new job: staying behind in the magazine’s deserted downtown mansion offices to uphold the “Delicious Guarantee”-a public relations hotline for complaints and recipe inquiries-until further notice. What she doesn’t know is that this boring, lonely job will be the portal to a life-changing discovery. Delicious! 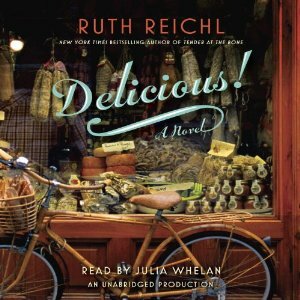 carries the reader to the colorful world of downtown New York restaurateurs and artisanal purveyors, and from the lively food shop in Little Italy where Billie works on weekends to a hidden room in the magazine’s library where she discovers the letters of Lulu Swan, a plucky twelve-year-old, who wrote to the legendary chef James Beard during World War II. Lulu’s letters lead Billie to a deeper understanding of history (and the history of food), but most important, Lulu’s courage in the face of loss inspires Billie to come to terms with her own issues-the panic attacks that occur every time she even thinks about cooking, the truth about the big sister she adored, and her ability to open her heart to love. I was disappointed in Delicious! It guess it just wasn’t the food novel I wanted to read. Quiet Billie, who grew up in the shadow of her older sister, heads off to New York on her own and surprise! Everybody loves her. She meets marvelous foodie people. She finds the perfect job(s) and is the one employee kept on after her magazine closes, which leads to a wonderful, marvelous discovery to her lonely hours in the empty mansion. It’s all just a little easy; she’s too perfect. Did I mention she has an amazing palate, can pick out the ingredients in seemingly any dish, but doesn’t cook? And I guessed the secrets a little early. I will say the food descriptions were mouth-watering. And the people were a colorful lot who I would enjoy meeting. Whelan did a wonderful job reading the book. It was like Billie was telling us the story herself. We could hear Billie’s innocence and hope and longing in her voice. She disappeared and just the books was left, if that makes sense. Maybe this is more chick lit than I wanted? All I know is, by about halfway through the audiobook, I didn’t really care. I did finish it, it wasn’t bad, it just didn’t strike a chord for me. I wanted more than a fun fluffy story. On the other hand, if you’re looking for a light story where the girl moves to New York and has everything work out just perfectly, go for it. What’s your favorite food novel? A lot of people loved it. This sounds a little too perfect for my taste, too. I think I liked this more than you did but not as much as everyone else has. It does seem like everyone’s loved it. For me…it was just ok…some times novels with letters in them do not appeal to me! I hesitated on this one, and now I’m glad I did. I find it easier to finish an audio book I don’t care about than a print one. Those end up as DNF, but for some reason, I keep listening. And once in a while I’m pleasantly surprised when the book gets better. That’s true for me too. I’m more likely to finish a meh audiobook. In print, I just set it aside and move on to the next one. Maybe it’s the audio version that isn’t good, because the negative reviews I’ve seen all deal with the audio version. I read it and absolutely loved it. Devoured it. Funny, I didn’t consider it light at all. I love so many different perspectives! I’ve been wanting to read this one, but now I’m not so sure. Maybe I’ll keep it in the back of my kind, but not go out of my way to get it.